Welcome to Owens Community College! This page contains a summary of consumer information that is available. For a printed copy of any of these disclosures, please contact the office or individual listed on that specific disclosure, or contact Oserve. The Annual Notice to Students regarding the Family Education Rights & Privacy Act of 1974 (FERPA) explains the student’s rights related to his/her student education records, including disclosure of information and directory information. For assistance with financial aid questions, please contact Oserve. Owens offers a variety of financial aid programs to assist the student. Please refer to the links on the left for information about the types of aid available, terms and conditions, eligibility requirements, and disbursement information. The Office of Disability Services website contains information about services and facilities available to students with disabilities. Please visit the Tuition/Fees website for information about tuition, fees, and additional costs. The Owens Board Policy manual contains the withdrawal policy and procedures. Instructions for adding and dropping courses are available. Information about refunds is available at our Payments and Refunds webpage. Students receiving federal financial aid may be subject to the Return of Title IV Funds policy. Credit balances are refunded to students based on their refund preference with BankMobile who is the College’s contractor for refund processing. To review the contract between BankMobile Disbursements and Owens Community College, please go to https://www.vibeaccount.com/swc/doc/landing/m3mxgjlx9mkidp2xlc7c. The Owens College Catalog provides information about available academic programs. Information regarding faculty credentials can be found at /credentials/faculty.pdf. Information regarding the complaint procedure for out-of-state online students can be found at /distance_ed/outofstate/. Information regarding transfer is available at /transfer/. For a list of articulation agreements with other schools, please visit /transfer/articulation. The Responsible Computing Policy provides information regarding acceptable computer use. Please visit the Academic Affairs website for information about accreditation. Owens Community College does not currently have a vaccination policy. College Navigator provides information about schools which includes costs, financial aid, enrollment, and other information. 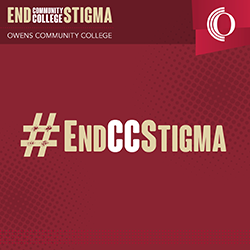 Owens Community College information can be found on the U.S. Department of Education’s College Navigator site. The College Scorecard provides information about a college’s affordability. The College Financing Plan provides a summary of a student’s financial aid in a standardized format so that students may compare costs and financial aid at various colleges and universities. Students who have applied for financial aid can view their College Financing Plan in Ozone by clicking on the Financial Aid link, then clicking on College Financing Plan. Click here to view an example of the College Financing Plan for an independent student with an Expected Family Contribution (EFC) of zero. The Consumer Finance Protection Bureau’s Paying for College website provides information about paying for college and a tool to compare financial aid offers. Information about the student body diversity is available at /student_right/heoa-diversity/. The Owens Net Price Calculator is available at /calculator/npcalc.htm. For textbook information, please visit the Course schedule and find the student’s registered courses. Click on “Find Books” to be directed to the bookstore. The student can also access the online bookstore for Toledo or the online bookstore for Findlay. Please visit the financial aid website for information about book vouchers. Voter registration information is available at MyOhioVote.com. Additional information regarding sanctions, health risks, and assistance programs can be found in the Student Code of Conduct. Completion, graduation and transfer-out rates for basketball, baseball, and other sports are available on the Student Right to Know webpage. Participation rates, financial support and other information about athletic programs is available in the Equity in Athletics Disclosure. The Student Right to Know Graduation Rates provides completion, graduation and transfer rate information regarding full-time students by gender, ethnic group, and Federal Pell Grant eligibility status. Retention rates are available on the Student Right To Know web page. All colleges report crime statistics to the U.S. Department of Education. This information is available at https://ope.ed.gov/campussafety/#/. Important information about the educational debt, earnings, and completion rates of students who attended federal aid eligible certificate programs can be found in the College Catalog or by visiting our Gainful Employment Disclosure webpage. Information about employment obtained by Owens graduates is available here. Information about grants and scholarships available from the State of Ohio are listed on the Financial Aid website. Federal student loan information is reported to the National Student Loan Data System (NSLDS). This information can be viewed by schools, lenders, and guarantors who are authorized users of NSLDS. Federal student loan borrowers can complete Entrance Counseling at studentloans.gov. Federal student loan borrowers can complete Exit Counseling at studentloans.gov. Owens has a policy and procedure with respect to private education loans. Owens Community College does not have a preferred lender list or preferred lender arrangements for any programs other than the Truck Driving – Commercial Driver’s License (CDL) Program. Owens Community College has a preferred lender arrangement with the Ohio Treasurer of State for the State’s Workforce Development Loan Program. This loan is only available for students in the Truck Driving – Commercial Driver’s License (CDL) Program. Students are not required to borrow through this program, and may apply for private education loans from another lender. Owens has elected to participate in this arrangement because it is the only one of its kind, and makes state-funded loan assistance available to students in a program which does not qualify for other forms of federal or state financial aid. Owens does not have an arrangement with any other lender because there is no other comparable loan program available.